In order to provide the homeowners of the Raleigh Hills area with an affordable and safe water supply, several neighbors came together in 1921 to incorporate a private organization called Raleigh Water Users. Samuel B. Lawrence, chairman, A. N. Wetterborg, Frank N. Kirby, L. W. Humphreys, and Edwin O. Isler made up the first Water Committee which ran the affairs of the corporation. Property owners within the service area could purchase a number of shares in the company based on the amount of land they owned, which financed the corporation in lieu of taxes. Bull Run water then, as it is now, was purchased from the City of Portland at a wholesale price to supply the area. 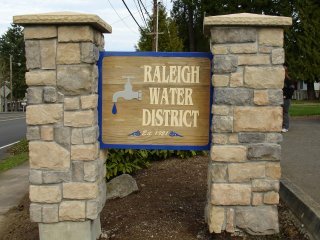 In 1947, Raleigh Water Users became Raleigh Water District, a domestic water supply district that operates under Oregon state law. The water district is a local government entity that is governed by an elected Board of Commissioners. The board is responsible for hiring a district superintendent and staff who are responsible for day-to-day operations. A booklet listing the Water Rates of 1923, a rare document of which only one copy is known to exist and is among the oldest records the district has kept in its archives. Rules and Regulations of Raleigh Water District, a booklet given to customers sometime in the 1950s. 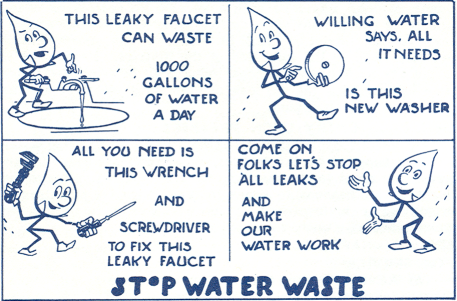 Its date of printing is unknown, but as shown in the booklet, it pre-dates the ZIP Code and lists the office telephone number as “Cypress 2-4894.” This booklet also features the mascot of the American Water Works Association, “Willing Water,” a water droplet who offered helpful water-saving tips. Willing was retired as a mascot in 1981.